Hamilton, ON – The Hamilton Bulldogs are 2018 OHL Champions following a 5-4 home ice win over the Sault Ste. Marie Greyhounds in Game 6 of the Rogers OHL Championship Series. Down 3-2 after two periods, Hamilton struck for three in the third as Riley Stillman (5), Robert Thomas (12) and an empty netter from Nicholas Caamano (10) put the Bulldogs in the lead 5-3. Sault Ste. Marie’s Jordan Sambrook (1) would draw his club within one with 45 seconds remaining, but time would run out on the Greyhounds as the City of Hamilton celebrates its first OHL Championship since 1976. The Bulldogs handed the 2017-18 Greyhounds their first-ever loss when leading after two periods, leaving them with a 49-1-0-0 overall mark in that department through the regular season and playoffs. 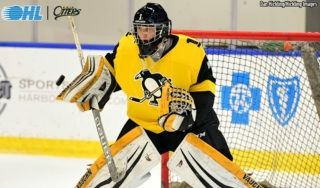 Bulldogs netminder Kaden Fulcher made 40 saves in the win, holding a desperate Hounds squad off in the third as they sent 18 shots on the Hamilton net for a game total of 44. The Greyhounds came out strong as rookie Cole MacKay (1) converted on a setup from Morgan Frost in the slot 11:57 into the first period. Sault Ste. 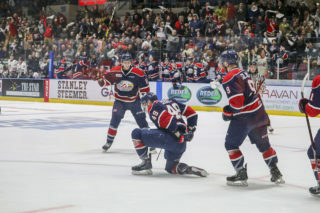 Marie would climb ahead 2-0 when Boris Katchouk scored his league-leading 19th of the playoffs on a goal-mouth scramble 3:10 into the second with assists to Frost and Taylor Raddysh. The Bulldogs battled back nearing the midway point of the second period, injecting some life into the 8,663 at FirstOntario Centre. Kaden Fulcher denied Katchouk in alone at one end before Brandon Saigeon (18) snapped a breakaway wrister over the shoulder of Matthew Villalta unassisted just moments later at 8:55. MacKenzie Entwistle tied things up at two with 2:23 remaining on the clock, wristing a long shot from beyond the top of the circles past the glove of Villalta. 2018 NHL Draft prospect Barrett Hayton would respond, giving the Greyhounds a 3-2 lead after 40 minutes as he took advantage of a power play opportunity to swing the momentum with 1:07 remaining. Hayton walked in off the top of the left circle to beat Fulcher on the short side and put the Hounds back in the driver’s seat. The Bulldogs came out hungry in the third and turned the tide, climbing ahead on a slapshot from Stillman at 8:28, a quick wraparound from Thomas at 11:30 and a hard-fought empty net goal from Caamano with 1:58 to go. Sault Ste. Marie outshot Hamilton 44-37 as Fulcher was there when called upon while Thomas and Entwistle both finished with a goal and an assist. The Greyhounds finished the regular season as the top-ranked team in the CHL before playing to an overall playoff record of 14-10, outscoring opponents 100-88. 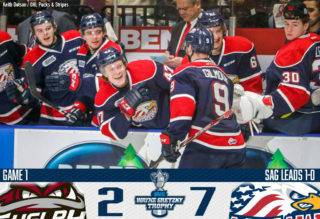 They eliminated the Saginaw Spirit in four straight games before edging the Owen Sound Attack and Kitchener Rangers in consecutive seven game series. The Hounds were without the services of injured defenceman Conor Timmins for Game 6 while overage forward Hayden Verbeek remained out of the lineup. Overage rearguard Noah Carroll played in his final OHL contest. 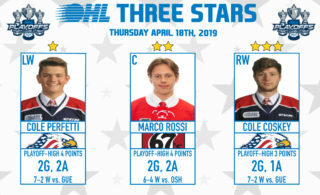 Tampa Bay Lightning prospects Boris Katchouk (19-18–37) and Taylor Raddysh (13-21–34) led the OHL Playoffs in scoring while Timmins (5-13–18) led all blueliners offensively. 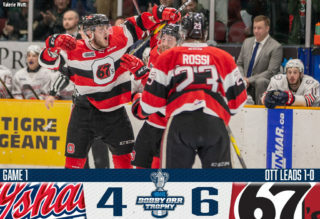 The Bulldogs played to an overall playoff record of 16-5, outscoring opponents 91-59 as they took consecutive five-game series triumphs over Ottawa, Niagara and Kingston before outdoing Sault Ste. Marie in six games. 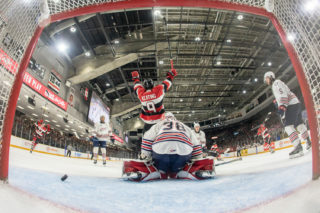 OHL Playoff MVP Robert Thomas (12-20–32) led Hamilton in playoff scoring while veteran centreman Brandon Saigeon led the club in goals with 18. The Bulldogs advance to the 2018 Mastercard Memorial Cup in Regina, Saskatchewan where they’ll open the tournament against the host Regina Pats on Friday night at 8:00pm CT/10:00pm ET on Sportsnet.